Patient-reported outcomes (PRO) are becoming increasingly recognised as essential to comprehensively collect chemotherapy-induced peripheral neuropathy (CIPN) symptom information. 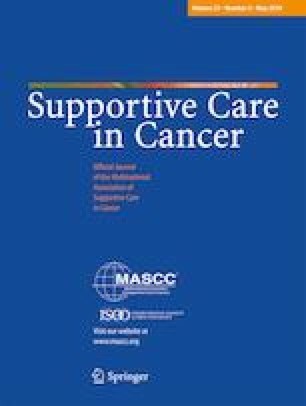 This study aimed to evaluate the utility and feasibility of CIPN PRO assessment tools in a real-world clinical setting through investigation of the correlation of PRO with NCI-CTCAE assessments particularly in relation to cumulative dose of chemotherapy. Patients receiving oxaliplatin or paclitaxel chemotherapy in Sydney, Australia, completed a questionnaire containing standardised CIPN PRO assessments (EORTC CIPN-20, PRO-CTCAE) via tablet device. PRO assessment scores were correlated with NCI-CTCAE grade determined by nursing assessment and analysed with respect to cumulative dose of chemotherapy. There were 87 patients who completed a total of 145 questionnaires, 68 in patients receiving oxaliplatin and 77 in patients receiving paclitaxel. CIPN PRO scores were associated with NCI-CTCAE grade, for EORTC CIPN-20 (r2 = 0.19, p < 0.01) and PRO-CTCAE (r2 = 0.41, p < 0.01), although individual patient correlation was poor. PRO assessments, however, identified higher grade symptoms, in particular symptoms causing functional impairment, at lower doses of cumulative chemotherapy compared to NCI-CTCAE. This study demonstrated that CIPN PRO may provide complementary information to nursing assessed NCI-CTCAE grade, particularly in earlier stages of chemotherapy and can be considered an important component in the comprehensive assessment of neuropathy. This study was supported by a Cancer Institute NSW Program Grant (14/TPG/1-05) and a National Health and Medical Research Council of Australia (NHMRC) Project Grant (#1080521). SP is supported by a NHMRC Career Development Fellowship (#1148595). The study was approved by the South Eastern Sydney Local Health District (SESLHD) Human Research Ethics Committee (HREC) and patients provided informed signed consent. There are no relevant disclosures.